Looking for the very best things to do in La Paz Bolivia? This is the article for you! Full of where to stay, a little history, where to eat, the best time of year to visit, and of course - the very best things to do in La Paz! Not everyone loves La Paz. Such a misconception, and ungenerous description, is common on the South American traveller circuit. And we were guilty of believing it; of expecting La Paz (which is NOT the capital) to be no more than just another bus connection and hotel room destination before we left for somewhere better. 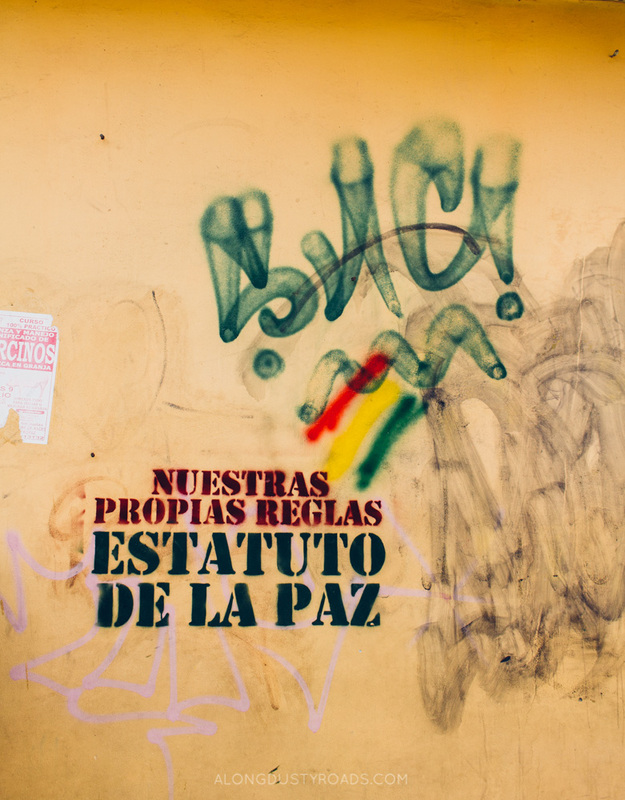 Over the course of an unexpectedly long stay in the city (more on that later), we grew to appreciate the rhythms, the sounds and the unquestionable heart of Bolivia's third-largest city. We wandered its streets, seeking out the characters living amidst its crumbling, aged walls. We chatted to wrinkled and toothless shopkeepers about their lives or tried to get a good deal on that day's fruit and veg from a battle-hardened, indomitable cholita. We drank cold bottles of beer on the pavement, an oasis of calm next to the chaotic, cramped roads with taxis, collectivos and buses jostling for each inch of space. We marvelled at the clothing of choice for men, woman and children, their centuries old traditions and struggles encapsulated in the cloth. For what it lacks in terms of of big-ticket, guidebook front cover worthy sights for the tourist, La Paz's streets and people provide endless numbers of serendipitous moments for the traveller; bizarre rituals, unique interactions with locals and a sense that you are, truly, experiencing a way of life that feels intensely, fantastically, foreign to all of your senses. It's a city to be discovered on foot or from above with a rough plan and a thirst to discover nuances and charms which others may miss, to witness the idiosyncratic Bolivian version of urban development and growth where extremely traditional approaches to life and commerce exist in tandem, and often at a curious juxtaposition, with the country's efforts to develop more modern infrastructure. In a number of ways, the city is home to a number of elements we will always remember about our three months in Bolivia. Here are our favourite experiences for travellers to the city, fun things to do in La Paz, as well as some essential information for making the most of your visit. The best way to see La Paz? Leaving it. A dilemma facing a number of cities in South America is that, with little rural development, thousands of citizens migrate to the nearest city for work or opportunity. For many of them, it is a fruitless endeavour where the hardship of the fields is replaced by a concrete-encased version of the same struggle. In La Paz's case, these migrants - mainly indigenous Aymara - had no option but to settle in the steep hills looking down on the city centre. This has ultimately led to the creation of a new city holding over one million, mainly poor, residents - El Alto (the Heights) - which is technically separate from La Paz but only a few minutes car ride away. Following in the footsteps of Medellin, Colombia, La Paz created mi teleferico - a network of cable cars. It has been heralded as a sign of progress and a visible attempt by the government to create and improve connections, both mental and physical, between those in the shanty towns and slums on the hills or whom live further up in El Alto, and La Paz - however its reception is mixed and there is controversy surrounding the costs. Taking the red line from Estación Teleférico Central to Estación 16 de julio, you will witness the scale of the Cementerio General (we've never seen anything quite like it - a true city for the dead), whilst the bird's eye view of the clustered city centre gives ways to travelling directly over some of the city's poorest parts. 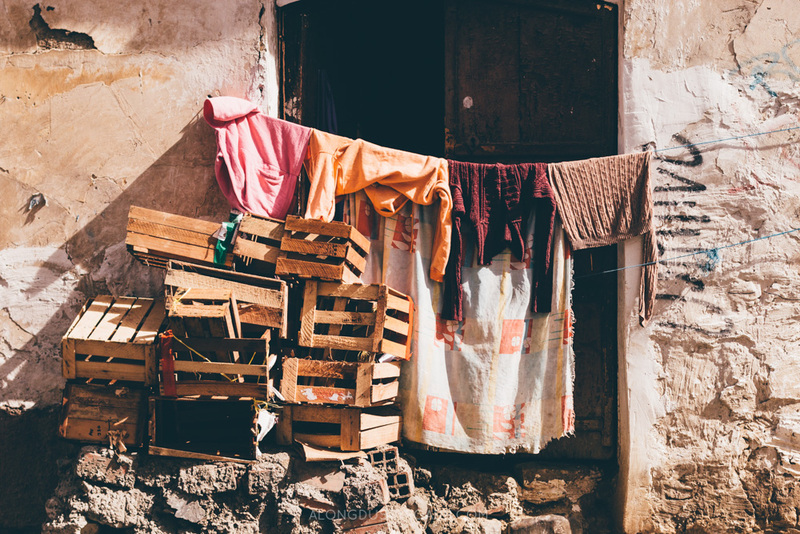 These ramshackle slums on hill will give you an entirely new understanding of Bolivian poverty and the many issues this country still faces. As you reach the final station in El Alto, be sure to walk outside to get a panoramic view of the Nuestra Señoara de La Paz (to give the city its full name) below, with its densely packed skyscrapers, churches and red-brick buildings and the imperious snowcapped Mount Illimani watching over its residents. It's quite a sight. As you are in El Alto anyway, we'd recommend you wander outside the terminal and turn left. Along this road (Avenida Panoramica), leading towards the city's huge market (Thursdays and Sundays), you will see a stretch of coloured cabins. Some will have crowds outside, others will have bonfires raging with an assortment of bottles and trinkets piled up next to it. These are the yatiris (shamen) of El Alto whom people visit to ask for luck, prosperity or, and this is totally true, curses from Mother Nature. Look, but do not take photos and be aware that Bolivians take this custom very seriously - read more about them and their traditions in this New York Times piece. Tickets for the cable car cost 3 Bolivianos one-way, buy them at the station. There are also excellent views available from the top of the yellow cable car line. For an alternative panoramic view of the city, visit the viewpoint at Parque Mirador Laikakota or if you like views mixed in with an adrenaline rush, then you can abseil down a 17-storey building in the centre of La Paz with Urban Rush for around 150 Bolivianos. In La Paz, you don't go to the supermarket; you go to Mercado Rodriguez. We were fortunate enough to have our basic hostel (one of few we could find with a kitchen) right next to this market. Our daily routine would be to visit it in the morning and in the late afternoon to weave between the myriad of stalls, take in the sounds and smells and scratch our heads when confronted with a new type of vegetable or fruit and questioning whether why the world was gifted quite so many varieties of potato. The scale of this market, which is partly undercover but mostly outdoors, is hard to fathom until you visit it for yourself and, for any budding foodies, it's a real treasure trove. We would purchase huge bundles or fresh basil or coriander for a few bolivianos, take home the plumpest, reddest tomotoes and dine out on perfectly ripe avocadoes the size of our fists whilst trying, and usually failing, to make friends with the indomitable, and incredibly hardworking, ladies who run these stalls from around 5 a.m. - 6 p.m. six days a week. Taking the time to actually do your shopping at Mercado Rodriguez, rather than just walking through it once for a photo and to buy a banana, is something we'd highly recommend to all visitors. It gives as much of an insight into Bolivia, and how cholitas form the backbone of it, as almost any other activity. Very cheap lunches are also available here. Start your journey through the market on the corner of Avenida Illampu and Rodriguez. If you followed us in Mexico, you'll know that Andrew is an (embarrassingly) big fan of wrestling. And so, he relished the opportunity to drag Emily to yet another exhibition of cartoonish battles of good vs. evil in La Paz (technically, the show is at the Colieso in El Alto). However, this is a wrestling show unlike any other; here, the women are the main event and call the shots. A cholita is a term which requires more than just a few lines of explanations, given its controversy and evolving usage in Bolivia. However, in very broad brush strokes, they are indigenous Bolivian women who wear bowler hats, big puffy skirts and pigtails (read this excellent BBC article on their struggles and increasingly important place in Bolivian society). Every Thursday and Sunday (18.30 and 16.30 respectively), women and girls who have trained in their spare time perform high-flying moves and brawl in the squared-circle with the shouts and screams of hundreds of fans and an increasing number of boisterous gringos. Cholita wrestling has become a big tourist draw in the city and there were elements with which we weren't too comfortable - namely that tourists (via their tour company) have exclusive access to the best seats in the house whilst locals are relegated to the 'bleachers' further away. However, the show is great fun and visitors have the chance to pose with photos with the wrestlers. If you've never been to a cheap wrestling show before, the whole event may seem utterly utterly bizarre. However, if you pretend you're seven years old again, pick a favourite for each match and cheer madly for them, you'll have a great time - probably one of the most unusual things to do in La Paz! Information: Most visitors choose to go to the event with a tour, available at any agency or hostel. The price is around 85 Bolivianos per person, which includes your transport, a snack and small souvenir. However, we were disappointed that we only seemed to be able to stay for 90 minutes before being herded back on the bus whilst the show still had an hour or so to go. Doing this without a tour is possible, and cheaper, but do be aware that El Alto is not the safest place in the world for you to be wandering around after dark. The free walking tour concept (i.e. it's not free) is now a booming industry across every major Latin American town. Although we don't always take them up as an option, often preferring to discover a city on our own, we heard very good things about the tour in La Paz and decided to give it a go. Meeting in the square outside the notorious San Pedro Prison (no matter how many times you've read 'Marching Powder' under no circumstances should you take tour there, it is simply not safe), English-speaking guides bring you to sights like Plaza Murrillo (with its reverse-clock dripping in symbolism) and several markets, all whilst providing a potted history of the city and country and some interesting cultural insights. If you're going to be in town for a few days, it's a nice and affordable way to get your bearings quickly whilst for those who are visiting for only a night, it allows you to understand and see more of the city than you might otherwise be able to on your own - definitely one of our top things to do in La Paz. Information: We went with Red Cap Walking tours, who meet everyday at 11 a.m. and 2 p.m. in Plaza San Pedro. No advance booking required. For us, there's no doubt that La Paz was one of the most enjoyable places to head out with a camera - there is literally a picture on every corner. A number of our afternoons - we were blessed with crisp, clear sunny days throughout our stay - would be spent discovering the city on foot. Its markets, its plazas and its streets, all oozed with atmosphere and character of a different way of living - a different age at some moments - and trying to get some perfect shots (which we'll be sharing in a future journal). Sagarnaga street and surrounding area, although the most touristy part of the city, is actually a great spot full of colour and felt safe during the day with cameras out. As ever, exercise caution with your camera, remain aware and your surroundings, avoid shooting at night and, above all, be respectful of your subjects. 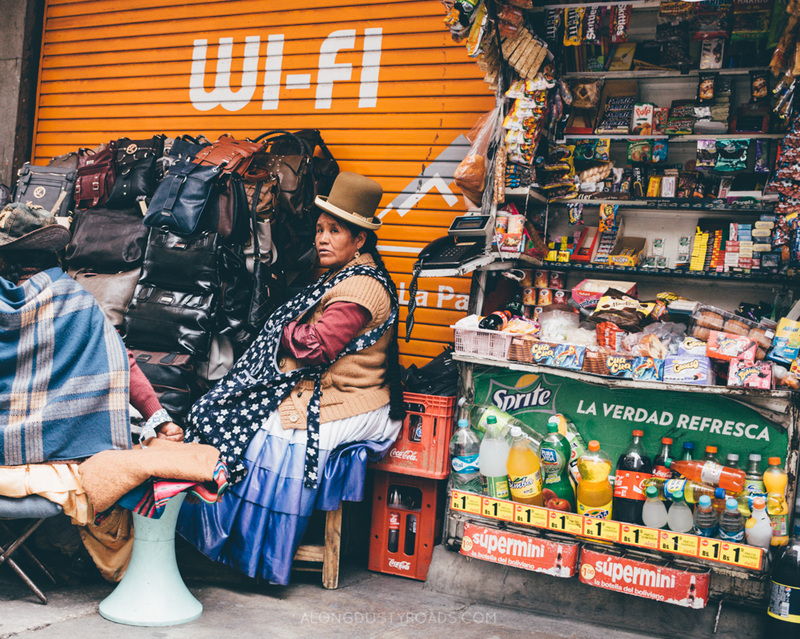 As we outline in our '18 things to know before you visit Bolivia' post, most travellers are likely to visit the city more than once through necessity rather than choice. The reason? Depending on your route, La Paz is actually the main jumping off point for a number of other destinations on the Bolivian backpacker trail. For example, those travelling to the Amazon in Rurrenbaque, the beautiful outpost of Coroico or taking a trip to Lake Titicaca are likely to depart from La Paz and return there once done (unless you have plans to travel through to Peru from Titicaca). Similarly, the Death Road Cycle - the jewel in the backpacker crown here - is also best taken as a day-trip from La Paz. This is why many travellers may end up spending more time in La Paz than they initially anticipated - they simply have to keep coming back to the city to go anywhere else! So, our advice is to find a hostel or hotel that you like and make sure that you return to it each time you're in the city. Two spots in La Paz offer excellent insights into core Bolivian cultural practices which may seem curious to visitors. First up, is the Witches' Market (Mercado de las Brujas, start at Calle Melchor Jiminez). As mentioned above with regards to El Alto, pachamama (Mother Nature) holds huge significance in Bolivia and other South American countries (you wouldn't necessarily think so when you see the litter...) and 'witches' are still called upon to bring about fortune, curse partners or enemies or cure a man's...performance...issues. In this market, curious and colourful objects (like dried llama fetuses) are littered on the stalls or small shops, each holding a special relevance or power when used by the right person. The market itself is not as interesting as we had hoped, but it is worth stopping by. If you've been confused about lots of old men and women having cheeks packed out like hamsters, then you'll find (some) answers at the Coca Museum (Linares 906, 10:00 to 18:00 from Mon-Sat, 13 Boliviano entry). It's small and a little dated, but we both loved discovering most about the history of the coca leaf and its evolution from traditional medicine to the base of Coca-Cola and, eventually, cocaine. Within the country, the coca leaf has huge cultural significance and, since Evo Morales became the first indigenous President, there has been an increased effort to maintain its legality for traditional and medicinal usage (there are also many people who are highly addicted to chewing it). The museum has limited English explanations but there is a man on hand to answer your questions and you can sample some coca products. There's also a really cute coffee/tea shop upstairs. Mozarella Pizza: So good and affordable, we visited it four times! The portions are huge, the price is low and the pizza is very very tasty. Be sure to leave a napkin with your details under the table! Namasté: Specialist veggie or vegan food is difficult to find in a lot of South America, so we were delighted to discover Namasté. It's a little pricier than most places, but still very much within a backpacker's budget and you can enjoy your meal guilt-free. Visit at lunch time for the excellent set menu. Cafe del Mundo: With reliable and quick internet being difficult to find in La Paz's hostels, this Swedish-owned coffee shop provides an excellent workspace or hangout for a day when you feel like eating some home-comfort foods or good coffee in nice surroundings and catching up on e-mails. Head up the stairs to find the best seats. Antigua Miami: Excellent little hipster coffee-shop with a young Bolivian owner who has recently returned to the country. Good coffee and teas, craft beers and a lovely outdoor area to enjoy the sun and plan the next step of your adventure. There is no wi-fi, but that's not necessarily a bad thing. - The collectivos (minivans) which make up a large proportion of La Paz's congested traffic are very cheap, however taxis are an inexpensive option to cover distances which aren't possible or advisable on foot. Prices are agreed, rather than using a meter, so make sure to ask your hostel for a ballpark price beforehand or, if hailing without knowing the price, ask one or two taxis before entering as it is not unusual for drivers to double or triple the price for tourists. Fake taxis are a risk in La Paz, so make sure that any taxi you enter has a yellow sticker on the windshield and back passenger side window which displays a 4 figure number. Also exercise your common sense and judgement before getting in any cab. We travelled with a number of taxis hailed on the street taking the above steps and had no issues but, if you're very concerned about safety, then consider asking your hostel to call a 'radio taxi' which is more expensive but will give you peace of mind. - The airport in El Alto is actually the world's highest at 4,058 m (13,313 ft), requiring an extended runway for takeoffs due to the thinning air. If taking a taxi, research the price beforehand and only travel with an official cab (around 70 Boliviano). It is possible to reach the airport by a very inexpensive collectivo (2-3 Boliviano) which originates at Plaza Isabel de Católica but also passes by Plaza San Francisco. However, if you are travelling at rush hour in the morning or late afternoon, factor in that that there will be heavy traffic and delays and these minivans will be full to bursting. - The main bus station is set in a very pretty building and provides connections to most places of interest in Bolivia (except those listed below). If you arrive here, then make use of the English-speaking tourist information desk to get maps etc. If you are taking a night bus from La Paz, then we'd recommend purchasing your tickets the day before or early on the day of travel to ensure availability and quality. If arriving in the daytime, then it is very possible to walk from the bus station to the main tourist area around Sagarnaga Street (where there are a number of hostels), however do bear in mind that altitude may make this much more difficult than usual. We would not however recommend making this walk at dusk or late at night. Taxis leave from outside the station and, although they'll try and get an inflated price from you, may be the best option (try to pay no more than 15-20 Boliviano, but you will pay more if travelling at night). - For bus transport to Lake Titicaca and Copacabana, your best bet is to catch the regular services departing from the Cemetery Bus station. Although it isn't really a station, more a street with lots of bus companies, you will have a departure every twenty minutes or so for around 30 Bolivianos. To reach Terminal Cementerio, we recommend taking a taxi and confirming the target price with your hostel beforehand. - For bus transport to Corioco, along one of the most scenic but terrifying roads we've ever been on, take a taxi to Terminal Villa Fatima where you will find mini-vans (trufis) touting for passengers so that they can leave when full. We'd recommend taking one of these, which are more expensive (25 Boliviano per person) than the large buses, but much quicker and more comfortable. 3600 Hostel: New hostel with beautiful design, helpful staff, great breakfast and a reasonably priced on-site restaurant. Check prices and availability here. Greenhouse Bolivia: Located in Sopocachi, this brand-new hostel ticks a lot of boxes - great self-catering kitchen (difficult to find in La Paz), very clean, great outdoor area and a friendly owner named Sergio. Check prices and availability here. Loki hostel: If you're looking for a party hostel, Loki's for you. On-site bar serving food, cheapish booze, clean rooms, pool table etc. Sure, you're not going to find Bolivian culture here, but maybe that's not what you're looking for? Click here for availability and latest prices. La Posada De La Abuela Obdulia: If budget is still a consideration, but you'd rather avoid the hostel scene, consider this place. Great rooms, good wifi, heating, nice breakfast and a lovely patio area. It's also pretty good value at only £33 per night or a double. Check current prices and availability here. Casa Mia Boutique Hotel: If you're looking for a boutique hotel that isn't going to break the bank, this is it. Ideally suited to couples, the rooms are really lovely and they have all the amenities you'd expect from a hotel - at around £50 a night. Check out latest prices and availability here. **Don't forget about Airbnb - La Paz is full of rental options. Not signed up yet? Do it now via our link, and you'll £30 get free credit towards your first booking! At 3,650 m (11,975 ft) above sea level, altitude sickness is a serious issue for new arrivals in La Paz. If you're fresh off the plane or bus from somewhere at low altitude, then you have to give yourself a day or two to adjust before you undertake any serious exploration or activity. Check out our guide to help you prepare for high altitude. - Given the altitude in La Paz, it shouldn't come as too much of a shock that this is a city that remains pretty chilly all year round - even in the summer months of December to March, when temperatures often don't push beyond 14°C. What, like most of Bolivia, does change, is the amount of rain it sees, with summer bringing plenty of storms and lot more water! - If you are in La Paz and need to extend your 30 day standard tourist visa (the next 60 days are free for most nationalities, but check your own country requirements), then use this guide to prepare.